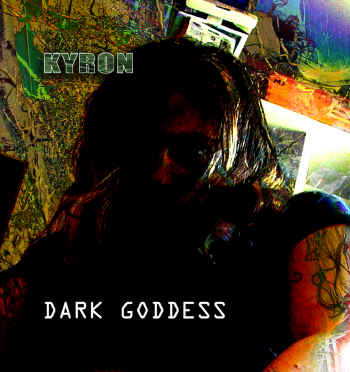 From inner space to outer space, through the organic swamps of subconscious creation into bright and burning cosmic ecstasy, Dark Goddess grips you in its fierce talons and wails into existence without inhibition. Electronic soundscapes that conjure cyberpunk images give way to organic beats, croaking, and mirthful debauchery. Listeners find themselves simmering in a cauldron with a multi-headed creature of mystery; which gurgles, groans, and squeals its darkness with frightening innocence. Before all is done, you realize that you have gladly thrown open Pandoras box and, heart aflame, flown into the center of creation upon the back of the winged serpent, hordes of fallen Angels at your side. Musically, Kyron has crossed a threshold. Dark Goddess bridges the evolutionary gap in his compositions. There are elements of the old shimmering in a new skin. Vivian Triantafillous vocal improvisations are too brave and stunningly beautiful to be human. This music is seductively pure. Dark and light fraternize, unsupervised by the false moral structures of the human dimension. Once the sound has gained entry to your system via your exposed ear canal, there is no turning back. You will be carried away into the eternal before you know what has happened. You will be altered. "You cannot help feeling that youre present at some sacred event, dark ritual."